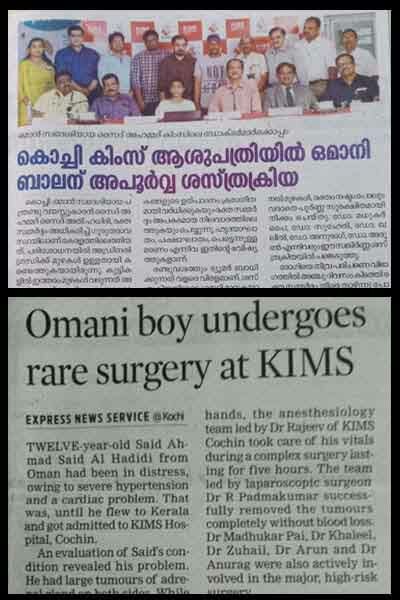 Said Ahmad Said Al Hadidi, a 12-year-old Omani boy, presented to KIMS Cochin with severe hypertension and resultant cardiac issues. He was found on evaluation to have large tumours of the adrenal gland bilaterally. These tumours called Pheochromocytoma are rare in children, especially bilateral tumors can be very rare. The boy's blood pressure was temporarily controlled with three types of drugs in large doses. Sudden blood pressure rises due to these tumours can cause heart attack, stroke or even sudden death. Adrenal glands also called suprarenal glands are endocrine glands which are located above the kidneys on both sides and has got the major function of secreting a variety of hormones. The Pheochromocytoma is a neuroendocrine tumor which affects the inner layer of the gland that can lead to uncontrolled secretion of Adrenalin and nor-adrenalin which cause dangerous levels of blood pressure. The patient was prepared for surgery by Dr Seenaj Chandran and Dr Sathyapalan. The Anesthesiology team led by Dr Rajeev took care of his vitals during this complex surgery which lasted five hours. The team was led by Laparoscopic Surgeon Dr R Padmakumar and they successfully removed the tumour on both sides completely without blood loss. Dr Madhukar Pai, Dr Khaleel, Dr Zuhail, Dr Arun and Dr Anurag were also actively involved in this major surgery as it was very high risk for patient's life. The patient was kept in the ICU for five days to counter the fall in blood pressure with drugs. The patient is presently doing well. 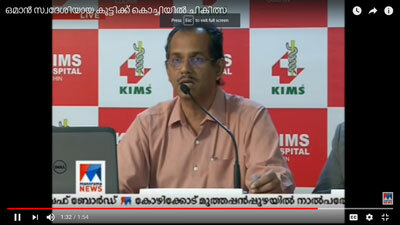 It is very happy to note that even foreigners are choosing our hospitals and experts for such advanced and complex procedures opined Dr Ashok Thiakarajan, COO of KIMS Cochin. Medical Director, Dr Jose T Pappanacherry, also spoke on the occasion.